Here’s a recipe straight out of the repertoire of Hilde, my “German mom”. It’s Käsekuchen, which translates directly as “cheesecake” in English. However, it’s lighter and arguably yummier than American versions made with cream cheese. This particular recipe appears in the cookbook of authentic German recipes I published last year. 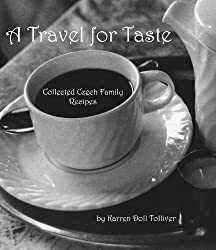 The title is A Travel for Taste: Germany (if you look to the right of this blog, you’ll see a picture of the cover in the sidebar. You can get your very own copy of it on Amazon – even a Kindle version! Please buy one – it contains all the translations of ingredients and amounts from German and metric into things you can easily find or make in the US. This Käsekuchen was the first one of Hilde’s desserts she ever served me personally and the first of her recipes I tried to duplicate in my own kitchen in the States. She’s served it to me more times than I can remember over the years and it’s always welcome. It’s the dessert that she always makes for my husband’s birthday when she can and he is totally in love with it. The cheese in this cheesecake is not cream cheese, but Quark, a kind of fresh cheese very popular in Europe. This recipe was the reason I figured out how to make Quark myself because I couldn’t find it in the States. Click here for the blog post where I tell you how it’s done. Fortunately I’ve noticed places like Whole Foods carry Quark now. Hilde gave me this recipe in 1995 and has since given me a couple of other variations she’s tried over the years. One even involved using Käsekuchen Hilfe (“Cheesecake Helper”) from a packet in the supermarket baking aisle. I think it was some kind of thickener/flavor-enhancer/time-saver preparation but totally not worth it. However, this original one is the best and the one I prefer. It’s definitely better than the cheesecake found in the bakeries in Germany. To add more flavor, drain and submerge canned mandarin orange sections or peach slices into the filling just before baking. If you use the fruit, increase baking time five to ten minutes. If the cheesecake sets up in the oven but the filling is a little wet, decrease the buttermilk to 1 ¾ cups (414 ml) and increase the oven temperature to 360 F (182 C) degrees during the last 10 minutes of baking. Here’s the version with mandarin oranges, done in a different pan and different oven – you can see the oven temp was higher than the previous one; thus the browning around the edges and cracks in the filling. Still quite edible, though. How would this work with a 4 inch spring pan?? Jana-Lena, thanks for your question. For a 4-inch diameter springform pan, it would work the same way. I’ve never used a smaller pan, but you would have to divide the crust and filling into correct proportions. It would probably be about 1/4 of the recipe for each 4-inch pan. As long as the crust comes up the side of the pan and the filling is below that before it is baked, you should be fine.